and for "LFO" dark fibre backhaul solutions (which operators use to connect "NRA" subscriber connection points and FCP for relaying traffic from the local loop) when they are employed by Free to relay traffic from its mobile base stations over an optical fibre connection. On 29 June 2017, the Paris Court of Appeal confirmed the Arcep decision whose conclusions regarding the "LFO" dark fibre backhaul solutions Orange had disputed. At a time of growing convergence of fixed and mobile networks, and a tremendous surge in mobile data traffic, thanks to improvements being made to mobile networks (and notably 4G rollouts), Free - which had relied heavily on local loop unbundling on the legacy copper network to connect its mobile base stations - had begun to invest in its own fibre rollouts to replace the copper pairs it had been leasing from Orange. To be able to pursue this strategy, Free needed to make use of Orange collocation and backhaul solutions. Free was therefore challenging the excess prices that Orange was charging for these solutions when they were being used to backhaul traffic from Free's mobile base stations over an optical fibre connection. 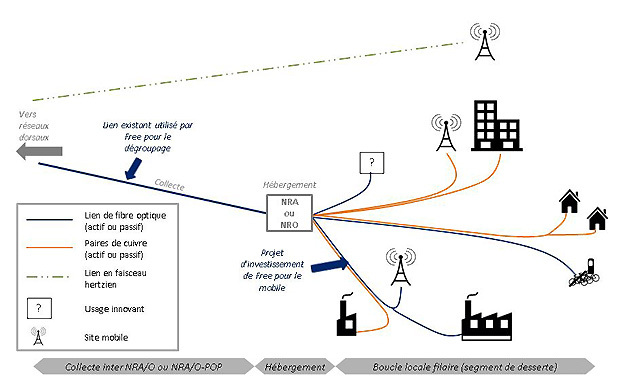 In its Decision of 28 July 2015, Arcep granted Free's requests, having concluded in particular that the additional charge applied to its "LFO" fibre backhaul solution ran counter to the objectives of fair and effective competition that is beneficial to users, of fostering innovation and technological neutrality and, second, that there was no evidence to justify Orange's appropriation of the value derived from its competitor's own investments. Paris Court of Appeal judgement validates this decision in favour of " investment and motivation for technological progress "
Orange had only contested Arcep's conclusions regarding the its "LFO" fibre backhaul solution to the Paris Court of Appeal. In its judgement of 29 June 2017, the Court endorses Arcep's reasoning, and rejects the appeal from Orange. In particular, the Court notes that the Arcep decision, " makes it possible […] to rationalise wireline networks deployed by operators as being in the general interest, and contributes to achieving the objective of efficient investment in new generation networks ". It also underscores that " overcharging, which results in Free assuming the artificial burden of the cost of building a network which would be as useless as it would be inefficient to build, only serves to impede, to everyone's detriment, investment and motivation for technological progress ". Arcep welcomes the judgement from the Paris Court of Appeal. This decision also reinforces its draft analysis decision on the broadband and superfast broadband market (Market 3a) for 2017 to 2020, which stipulates that the Orange generic passive backhaul solution must enable the backhaul of fixed local loop traffic, regardless of the traffic's origin, and at prices that are not contingent on the nature of that traffic.